The employment report for April produced no surprises. Job gains remain relatively strong, the unemployment rate continues to tighten, and wage growth is ahead of inflation. It is curious that wages and salaries are not rising faster given the tightness of the labor market. This is disappointing for workers but it will keep the Fed on track for three rate hikes this year because inflation remains predictably in check. It’s likely that stock market volatility will also subside, at least for the meantime. 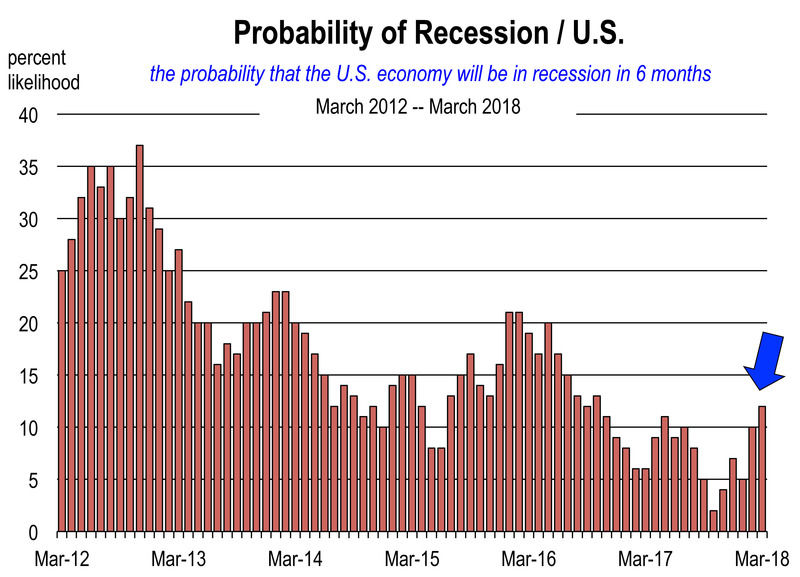 The probability of recession rose in March but still remains low. The odds of a recession this year should be low because recessions occur when imbalances develop in the economy, and no glaring potential macroeconomic imbalances are forming. The labor markets continue to create more jobs, and the financial markets, while exhibiting more volatility since January, still remain buoyant. A fully employed economy, rising housing values, improved access to credit, and low household debt are driving both the consumer and business investment engines of economic growth. Consumer confidence remains near its highest level in a generation. The present economic climate is rated consistently more favorably while economic expectations remain strong. 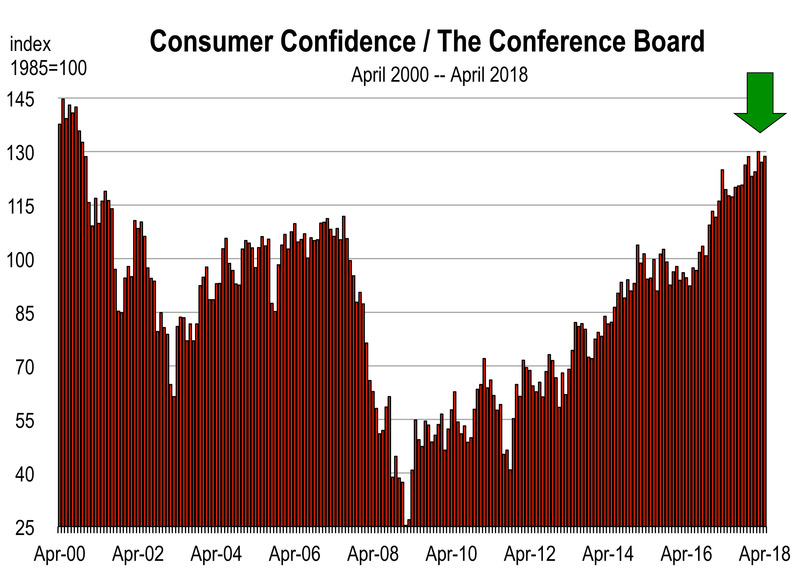 Consumer confidence at these stratospheric levels is consistent with a fully employed economy, households with rising real wealth and low debt, and low inflation. Further tightening in the labor markets is likely this year, even as the pace of job growth continues to moderate. Employment growth has gradually declined toward 150,000 jobs a month in the U.S. and 20,000 jobs per month in California. This moderation is expected to continue through the rest of 2018. A decrease in job growth is not abnormal at this stage of the business cycle and should not be mistaken for an economic slowdown. However, as long as job creation continues to exceed the flow of entrants to the labor market (80,000 to 100,000 a month), the unemployment rate is very likely to fall to 3.5 this year. Currently, the rate is at 3.9 percent. Slower population growth and aging of the population will continue to exert downward pressure on labor force participation rates which will restrain labor force growth. The environment in California is even more austere regarding labor market capacity. The unemployment rate has now reached a level that it has not achieved since the late 1960s. And predictably, wages have been rising more sharply here than in the rest of the nation over the last 18 months. This year employee compensation is forecast to rise 4.0 percent compared to a 2 percent increase in 2017.2 Average salaries are forecast to rise 3.0 percent in California this year, after relatively hefty gains of more than 3.0 percent in the Bay Area economy during 2017. Even though the stock market has been under pressure since January (largely because of rising interest rates), the rest of the economy has remained more steady. This includes consumer spending, business investment, manufacturing, and surprisingly, inflation. I believe that economists are much more focused on inflation than previously, because the labor markets should be producing faster wage growth now. We are watching for any unexpected movements in inflation because that would pose one of the bigger risks to interest rates and the economy this year. That said, nothing seriously out of the ordinary is within view. At our vantage point right now, it appears that the economic indicators for 2018 will remain auspicious. 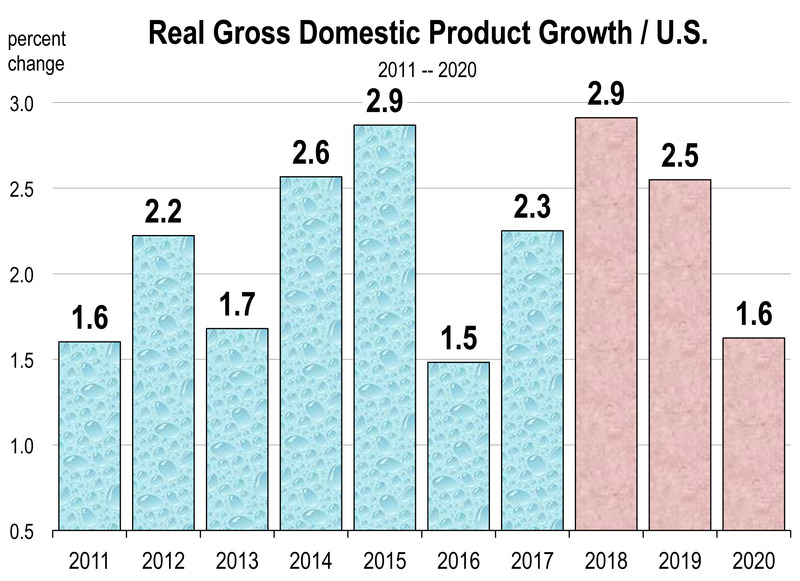 The consensus forecast has real GDP still on track to expand at a pace of close to 3.0 percent this year with a slowdown strongly projected for 2019 and 2020. 2 UCLA Anderson Forecast for the State and Nation, March 2018, page Nation-15.